Where do I even start? I’ve known Jace for all of his life. You see, he’s my “little” brother – albeit, he’s not really that little, especially when he stands next to me. 😉 We tickled. We fought. When we were kids, we played Playmobiles together ALL summer long. When he was 3, we would spend hours in our coat closet pretending to be in Never, Never Land – yes, that’s right. I beat him playing Mario Brothers on Nintendo….until he turned about 7 and could annihilate me – and then I quit playing. I was one of the crazy screaming fans when he was Quarterback for his high school football team. And when I heard that he was in love with Rachael, I cried. Many, many happy tears. You see, Rachael is perfect for Jace. She knows and loves Christ and has a passion for Him, has a heart of gold (cliche, I know…but true), and loves my brother deeply. The first time I met her, I just knew. Call it sisterly intuition or something, but I just knew. And I prayed. 🙂 I am sooooo excited that come September 17th, I’ll be able to call Rachael my sister!! Anyways, I have vowed to NEVER be the wedding photographer for my siblings. I want to be able to soak it all in on that day. And I want to have the freedom to bawl my face off during the ceremony. 🙂 It wouldn’t have worked out so well for me to be the photographer in this wedding anyways since I’m a bridesmaid…that would look a bit funny – jumping in and out of the lineup to grab some quick shots. 😉 So, I was more than delighted when they asked me to take their engagement photos! 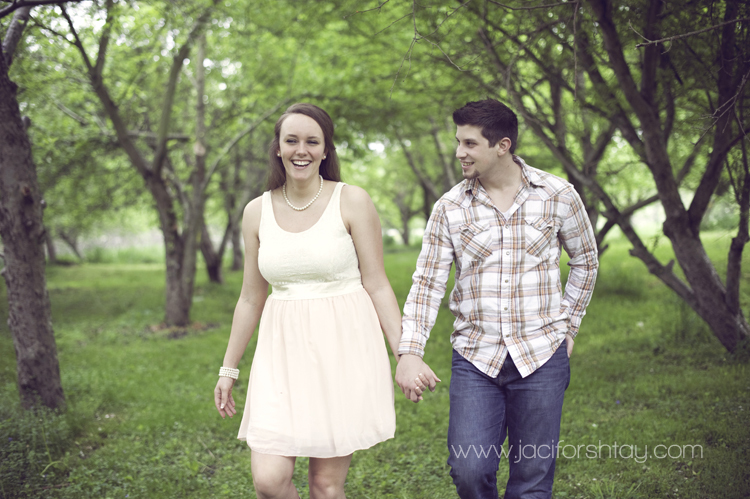 So pleased with these images, I hope you can feel the love they have for each other and the FUN they have together!